Looking for a pinch hitter for your pre-event publicity? 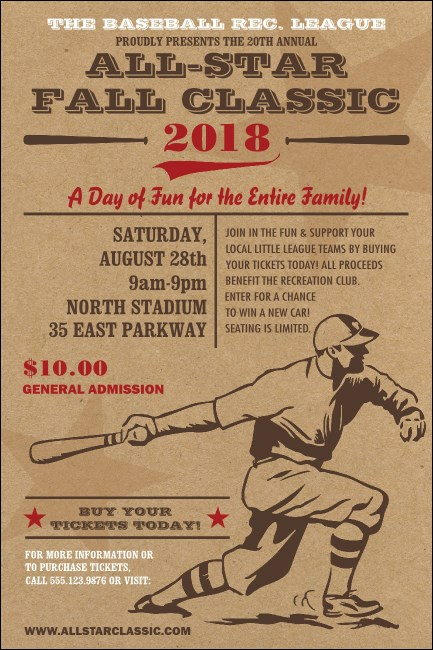 If the same old promotions aren’t giving you the same scoring runs, print classic All Star Retro Baseball Posters and post them around town before the big game. These sandy-colored beauties feature a player in vintage gear who’s about to run to first. Fill in your event info in the template below. Round third and sprint toward home plate with Event Kits from TicketPrinting.com!